An early frost on 14th October has damaged many summer vegetables and I was a little caught out by the air temperature of -1C (lower at ground level) which was enough kill leaves of squash and courgette, with the plants barely surviving. 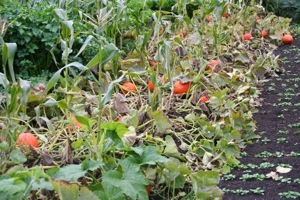 If you still have winter squashes to ripen and green leaves on the plants, I would leave them to enjoy the warmer, sunnier weather coming (in the south at least) in October’s last week, and then harvest at month’s end. 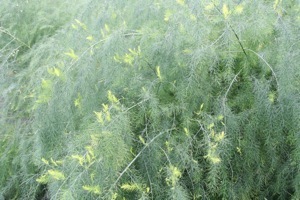 So late, new growth on asparagus, catching up after a slow summer. 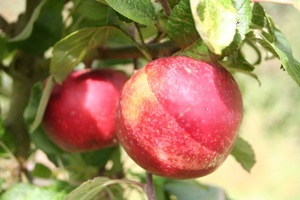 Red Windsor apples taste as good as they look! A mesh or net cover can keep them off, thank goodness. A different problem for me in the past fortnight has been deer whose numbers have escalated hereabouts, and now they hop over the four foot high barbed wire fence with great ease to graze on chard, beetroot leaves, endive and chicory. A lot of plants can be badly damaged in just one night: if I was staying here I would put up a white ribbon electric fence, as advised by bogbean on the pests forum under “badgers ate my sweetcorn again”. Another new and unwelcome pest is leek moth, which arrived a little later than usual and in greater numbers, such that leeks are now my worst harvest of the year, although there are still some tasty stems below the eaten parts. Mustards and lettuce planted in well decomposed cow manure. 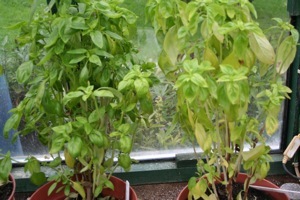 Left hand basil is in my own compost, right hand is multipurpose, showing the nutrient retention of good compost. 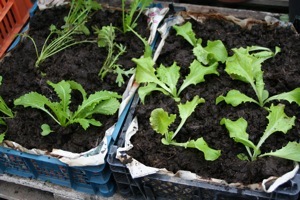 Keep planting those winter salads, in soil or containers. I am filling blue mushroom trays with a mix of mostly cow manure and home made compost, then putting six or eight plants in each, of Grenoble Red lettuce, mustards, spinach, salad rocket and winter purslane. Chervil, coriander and parsley are already planted in pots, to grow initially in the greenhouse here until I can sort something out at Homeacres, which is currently all grass and weeds, no photo yet. 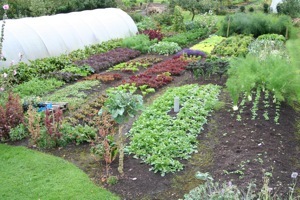 You can look at previous October posts to see polytunnels planted with winter salad; I feel strange not doing it! 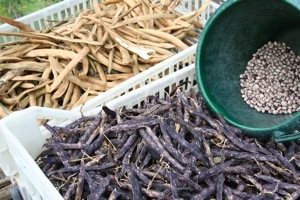 Beans drying, Czar behind and Borlotti in front. 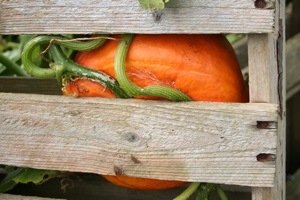 This squash lives up to its name, U. Kuri growing in a compost heap – I need to cut the wood to harvest it! Dry beans have cropped brilliantly in the end and they are so delicious: I have never been a great fan of runner beans but leaving the Czar unpicked, to become butter beans, has been a revelation, and the food is then available to eat all winter instead of being a glut in August. 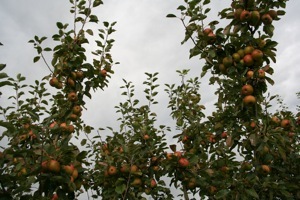 If you still have green tomatoes and some healthy leaves, and don’t need the space for winter plantings, they will ripen some more and better if you give no water. Mine are unwatered for three weeks now, also none for peppers and chillies to encourage them to colour up. 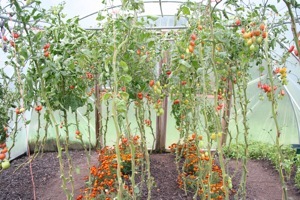 Tomatoes on October 14th, still many to ripen. Ruthje from Stormy Hall Seeds, lovely flavour but slow growth in summer. As much as this can feel like the end of a gardening year, it is also the beginning of another, and all the time you are able to spend on cleaning and feeding your soil in October will be repaid many times over next year. 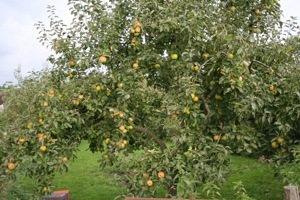 I have had a good season in 2012, despite the weather, and that comes from being prepared! 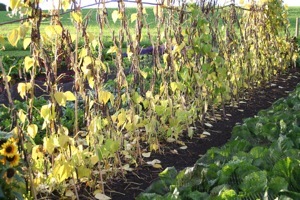 One misunderstanding about growing vegetables that I should love to clear up is about covering soil in winter. 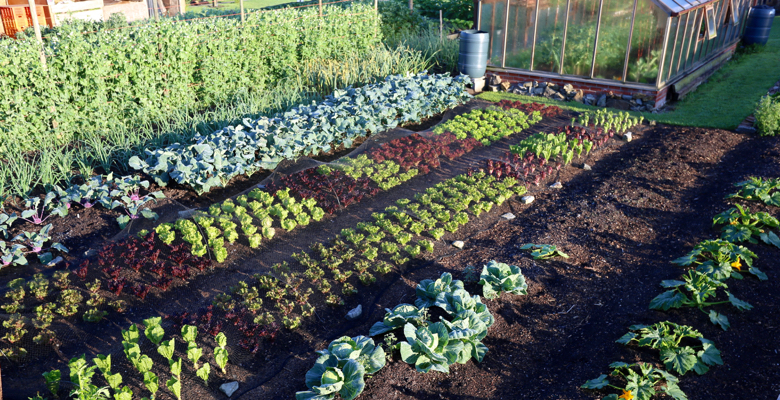 Even many organic gardeners worry about leaching of nutrients from their compost or composted manure, as though it is an artificial fertiliser with water-soluble nutrients. 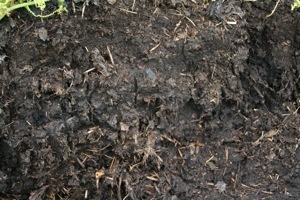 Whereas my experience shows how the nutrients are retained in cold conditions when soil life cannot and does not mobilise them, and also in warmer but bare soil when no roots need them, until growing roots ask for them at any stage, often through cooperation with soil fungi such as mycorrhizae. For example, look closely at the first two photos on my home page, and also here, where the bottom garden is now growing an abundance of autumn vegetables from second plantings by late summer, all without any addition of compost, manure or any other feed or fertiliser. Most beds had been covered in compost and manure before Christmas (see February update for a photo of the mostly bare beds), and just one bed was composted in April after a harvest of leeks. 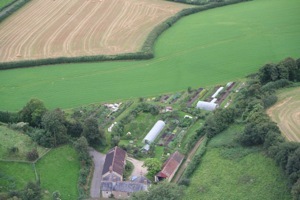 Notice the bed on the left nearest to the tunnel, in which on June 8th, as the garlic finished growing, I drew drills in the remains of manure (most had been pulled in by worms) to sow beetroot, which you can see in this photo. 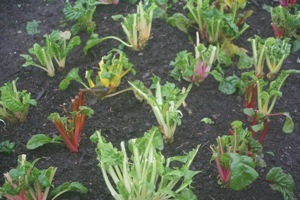 All second plantings except leeks, celeriac, beans: beetroot sown between garlic. If the manure’s nutrients had been leachable and washed out, this beetroot and all the other vegetables such as celeriac, swede, leeks, kale and many salads, would never have grown so abundantly. Remember all the rain that fell last November and then this spring and summer, and now see how abundant the growth has been because soil, thank goodness, has the wonderful ability to be washed through with water and hold on to its store of food for plants, when the nutrients are locked into organic matter. And the wonderful part of spreading organic matter on the surface of undisturbed soil is the food and protection it gives to soil life, another vital aspect of abundant growth above ground. So before the coming winter, it is good to spread organic matter which has decomposed to the point of being dark and interesting. Using less well rotted compost is also possible, and better than leaving soil bare, but it will need longer to finish breaking down in the spring and is best used where you want to plant later vegetables such as courgettes and summer beans. 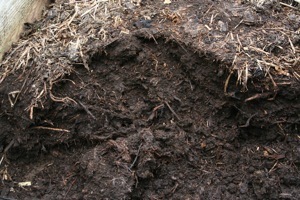 As you spread the organic matter, break up any larger lumps with a manure fork then smaller lumps will be broken down by weather: the virtue of compost on the surface is that air, water and ice can move in and out of it with decomposition continuing, resulting in a soft tilth by spring, which I find is very friendly for seeds and plants. 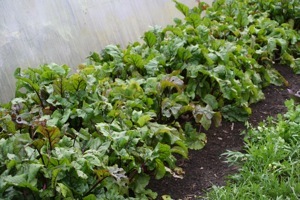 If you grow short term green manures over winter (with one or two exceptions such as mustard which is killed by frost and leaves just a fine straw of old stems on top) they need digging in or mulching in spring, which delays sowing and growing as they take nutrients to decompose; green manures also serve to maintain or increase the slug population, and usually shelter weeds going to seed. A better way to use green manure is on areas not needed for at least a year, where grasses, clover, alfalfa, vetch and so forth have time to grow extensive roots and add reasonable amounts of organic matter and nutrients. So for this month, seize the chance to clean and feed your soil, leaving it covered for winter in a layer of either fine or lumpy compost, whatever you have available. Plant garlic now, and broad beans in colder regions, but wait until November to sow broad beans in southern Britain where they can otherwise grow long stems before winter, making them susceptible to frost. 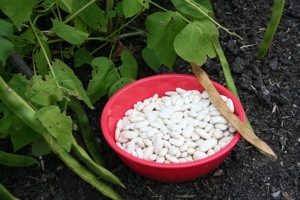 Runner bean Czar, picked as dry pods and shelled out. Borlotti beans just finishing growing. 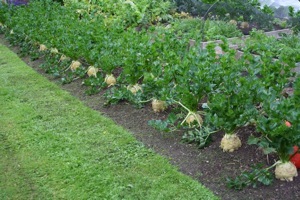 Celeriac Prinz planted 16th May. Uchiki Kuri squash is ready to harvest with leaves dying off. Undercover it is time to finish planting salads for winter, of plants sown in September. 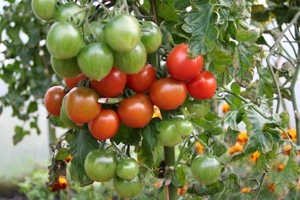 Tomatoes may still be cropping and can continue until the last possible moment when salad plants are needing to go in, sometimes I pull out tomatoes and plant salads on the same day. Finally on a personal note, I am in a period of upheaval and leaving these gardens at the end of autumn, planning a new garden nearby where I can continue experimenting and teaching. Currently it is all grass and weeds. The website continues as before and I shall continue these monthly posts. I hope your autumn is good, and do continue to post on the forum which has become a fine source of information about the methods and qualities of a no dig approach, and about all things to do with growing our own food. 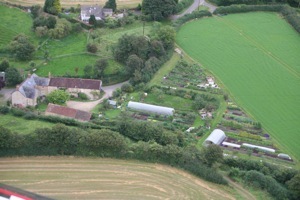 Aerial views of Lower Farm and gardens, a chance to see all the gardens in the same frame.